We want to query a database table and display the rows in the form of a ListView. In my previous articles on ListView, we used in-memory list as the data source. Please see Android ListView Tutorial to know how to build a ListView. Since the data source is a database, we need to create an SQL query, execute it, retrieve the rows and somehow bind each database row to a ListView item. Before we query the database, we need some sample data. 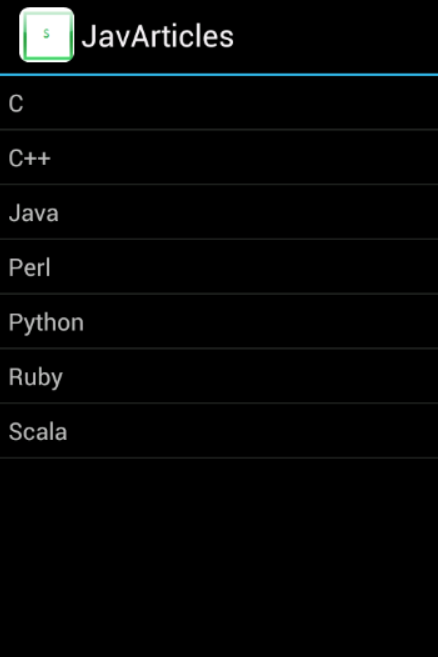 We will insert some programming language names into a table called ‘languages’. To keep things simple, table ‘languages’ has got couple of columns ‘_id’ to store primary key and ‘lang_name’ to store the language name. We will use Android provided helper class SQLiteOpenHelper to manage database creation and read/write operations. Our class SQLiteHelper extends SQLiteOpenHelper. The database is created the first time getWritableDatabase() or getReadableDatabase() is called which in turn returns use SQLiteDatabase an object wrapper around SQLite database. Once the database is created, the framework will call onCreate(), onUpgrade() or onDowngrade() and onOpen(). It will pass the SQLiteDatabase instance to these method calls. Method onUpgrade() will be called only when an upgrade is required which the framework figures out by comparing the database version with the one passed in by the application code to the current SQLiteOpenHelper instance. If there is an increment in version onUpgrade() is called else onDowngrade() will be called. In onCreate method, we will use the SQLiteDatabase instance passed in to create some test data. We will call execSQL() method to create the table and some test data. See Android SQLite Example for more details. In order to display the database rows in a list, we need to be able to query the database. Android relies on another important abstract object called ContentProvider to provide content to the application. The idea is to decouple the application components that from the type of underlying data sources. It provides a generic mechanism through which applications can share their data or consume data provided by others. To create a new Content Provider we need extend the abstract ContentProvider and implement query(), insert(), update() and delete. In onCreate, we create an instance of SQLiteHelper, this will automatically create a database for us. The purpose of this article is to display database records in a list view so we only have to implement the query. We can either use Android’s SQLiteQueryBuilder helper class to build the query or directly execute the SQL using SQLiteDatabase.rawQuery(). Either way, the queries return a Cursor object. Cursor is another abstraction around the database result set to navigate through the results and retrieve specific data values. We will also have to declare our content provider in androidManfest.xml. corresponding row in the underlying Cursor returned from a Content Provider query. 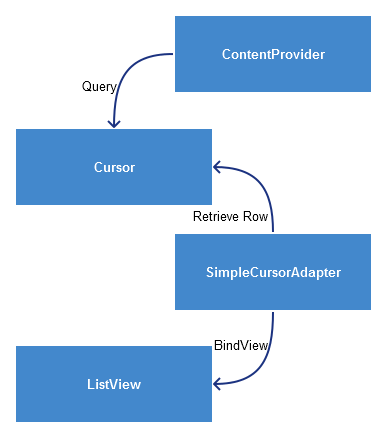 Below diagram show the relation between SimpleCursorAdapter, ContentProvider(), Cursor and the view. We create SimpleCursorAdapter object in the onCreate() method of our ListActivity and then set the list adapter calling setListAdapter(adapter). R.layout.container_list_item_view is the list item view. We want to fetch the language name DatabaseConstants.COL_LANG_NAME and set it to the view identified by R.id.list_item. Here is the ListView layout. and here is the list item’s layout. If you notice, our ListActivity implements LoaderCallbacks<Cursor>. This to make sure that the query is run in background in a separate thread. We have three main components related asynchronous loading. for changes. A Loader is identified by an integer ID. A LoaderManager manages one or more Loader objects. We will use it initiate the loading process. A CursorLoader is a Loader object that performs asynchronous queries against Content Providers, returning a result Cursor. onCreateLoader() – this is called when the loader is initialized. Remember we have initialized the loading process in onCreate() of our list activity. This should create and return new CursorLoader object. onLoadFinished() – this is called when the Loader Manager has completed the asynchronous query. onLoaderReset() – this is called when the Loader Manager resets your Cursor Loader. Our ListActivity implements LoaderCallbacks<Cursor> so that we can load the data asynchronously. In onCreate method, we set the content view to list view layout R.layout.container_list. We then create SimpleCursorAdapter and set using setListAdapter. What follows next is the loader manager calling the callback methods onCreateLoader() and onLoadFinished(). In onLoadFinished(), we call _adapter.swapCursor(data). This will bind the Cursor data to the list item view for each database row fetched. This was an example about building ListView using SimpleCursorAdapter. We showed you how to create your own ContentProvider and override query() to create Cursor. We also showed you how to load data asynchronously using LoaderManager.